Imagine the serenity of a hill country morning enjoyed from a deck nestled in the woods. You catch a glimpse of deer and other wildlife stirring. 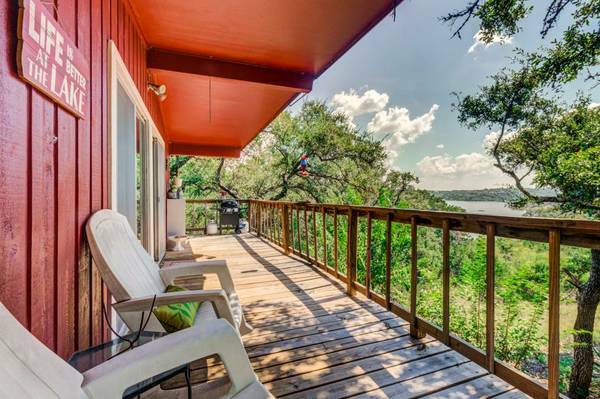 Lake Travis is straight ahead and you’re surrounded by the sounds of nature. Whether you’re ready for peaceful country living (without giving up all of the amenities Austin has to offer) or just want to lease it to someone else as an investment property, you need to check out this adorable 2 bed, 1 bath lake cottage in Spicewood, Texas situated on the waterfront of Lake Travis. Perfect for fishing, hiking, or just peace and quiet. Great news! Seller will consider parting with most of the furnishings! This property can be used as a peaceful get-away, an investment property, or a full time residence for someone looking to simplify, but still be close to Austin. Spicewood itself offers plenty – besides just minutes from the Hill Country Galleria and shopping galore, there’s Krause Springs, Opie’s BBQ, Spicewood Winery, golf courses, a small airport, ziplining, and more. With 7.5 acres, there’s plenty of room for adding a garage, workshop, or even cabins for guests. Come see it for yourself or tell your friends! For more information, go HERE.